Before getting your air fryer, you may think that it can never replace using regular oil. To some extent, you’re right, but you will be amazed by how quickly you will adjust to this method of cooking. While we still think that oil frying can be delicious every once in a while, after experiencing the speed and convenience of the Brio 3QT, we can’t see any reason to waste so much time, energy, and calories ever again. Plus, you will never have to worry about hot grease getting all over your kitchen! 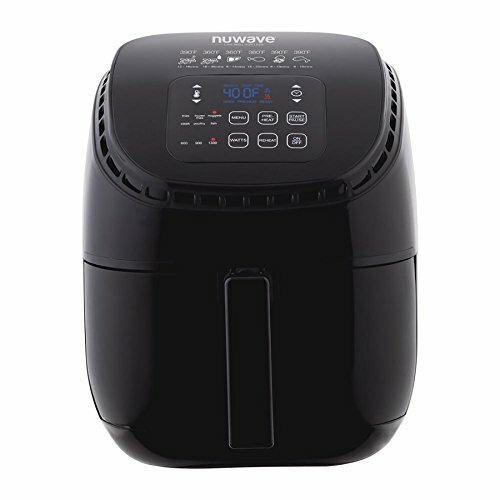 The NuWave Brio 3-quart air fryer is the latest models. 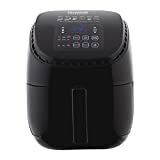 It is upgraded from NuWave 36001 Brio Air Fryer that has a narrower temperature range. Overall, we love what the Brio 3 quart has to offer, and we can’t imagine frying with oil now. We believe that your experience will be the same. If you’re like us, then you love fried foods. Whether it’s french fries, fried chicken, or something more zesty like mozzarella sticks, these treats are always a hit with both you and your family. However, as we all know, fried foods are not the healthiest. Dripping with grease, they add a ton of unnecessary calories to our diet. Fortunately, there is a better way. With a digital air fryer from NuWave, you can get the same delicious flavor (and texture) with less than half the fat. Since you’re no longer using oil to cook your food, you can enjoy them without the worry about how they are affecting your body. Learn more about health benefits of air fryers. Today we’re looking at the Brio 3 quart model from NuWave (If you are looking for an infrared oven, check out our NuWave Infrared Oven reviews). Let’s see what it has to offer. Cooking for your whole family can be a challenge, especially when it comes to making enough to go around. When it comes to fried foods, this can be even more difficult because you don’t have an industrial deep fryer like they do at restaurants. Fortunately, the Brio 3 quart. has you covered. With a massive three-quart capacity, it’s super easy to make large batches of your favorite sides or main dishes. 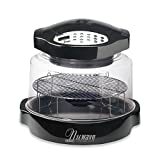 French fries will come out by the bowlful, and you can cook lots of savory wings or chicken pieces at one time. Also, since the process of air frying is so fast, you can always make multiple batches of everything quickly enough to where no one will go hungry. Not only that, but seconds are just a few minutes away. 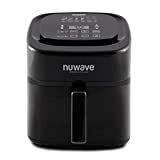 If you are looking for a larger NuWave air fryer, you may want to check out our NuWave Brio Digital Air Fryer 6 qt review. One of the reasons that an industrial fryer is so efficient is that you can set the temperature to whatever you need it to be and keep it there for as long as you like. Thus, cooking is much less of a hassle because you don’t have to guess whether the oil is hot enough. With the Brio 3quart, you can control your cooking temperature and time as precisely as you like. The gauge goes from 100 to 400 degrees with just 5° increments. You can both reheat and cook your food both rapidly and thoroughly. Since this model comes with a cookbook, you can see what temperature settings are best for all of your favorite dishes. Just push a button and watch the machine do the rest. While precise control is crucial in cooking, you can make things even easier on yourself by using one of the six preset options that come with the Brio 3 quart. They include fries, frozen fries, nuggets, steak, poultry, and fish. What you will also find is that these presets work on a variety of different options. Just because it says “fries” doesn’t mean that you can’t use it for other fried goodness, like mozzarella sticks or potato wedges. Let your creativity guide you through the cooking process and use the recipe book as your resource. Frying foods use to be a huge pain – waiting for the oil to heat up and then cleaning everything afterward almost made the enjoyment of the food itself not worth the trouble. Fortunately, everything about the Brio is designed with convenience and speed in mind. The digital interface is a testament to the level of care and attention to detail that the manufacturers have put into this device. Setting your temperature is as easy as pushing a button. There is a preheat setting to get the fryer warmed up in minutes (much faster than a deep fryer). Accessing the preset controls is as easy as can be. No matter what you’re trying to do with the Brio, you can get there in a fraction of the time it would take to cook these foods with a traditional fryer setup. Even if cooking was all you could do with the Brio 3qt from NuWave, that would be more than enough of a reason to have it in your kitchen. However, there are two other options available to you that make this machine even more valuable to your cooking process. First, you can reheat your leftovers much more efficiently than a microwave, with the added bonus of not worrying about radiation leaking into your home. Second, it can also work as a dehydrator, allowing you to make all kinds of dehydrated foods that you love. The recipe and instruction book provide details on how to do this, so feel free to experiment and see what kind of delicious options you have beyond frying. You can put aluminum foil, metal and some glass pans and even frozen entrée trays in the Brio when cooking your favorite food. They are safe. Additionally, any cooking utensils that can be used in a conventional oven can be used in this air fryer. 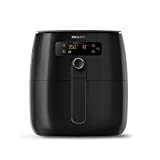 If you still want to compare with other models, check out our best air fryer reviews.